We as Americans have a lot to say about our country. Fortunately we live in a country where we have the freedom to do that, in many formats: through literature, film, music, journalism, you name it and it’s been done. But some Americans have pretty odd ways of making a statement. Whether they do it for the attention or they just think it’s a good idea is another question, but there seems to be some weird trend with flying things into our country’s capital. 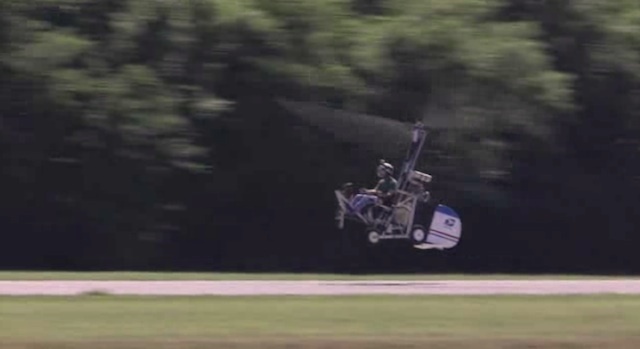 Recently, Floridian Doug Hughes flew a gyrocopter from Gettysburg, Pennsylvania to Washing D.C. Why? To bring the U.S. government attention to campaign finance reform, of course; what other ways are there to deliver this vital message? The owner of DemocracyClub.org landed safely on the west lawn of the Capitol building this Wednesday April 15, 2015 and was immediately taken into custody on-site. Even though he wrote a nice letter for each member of Congress (two-pages for each of the 535 members, to be exact), I only wonder if his words made it that far. But hey, Hughes has the support of marijuana lobbyist Richard Burns. Here’s my take: this man has something to say. He isn’t basing his gyrocopter-landing on some ridiculous conspiracy theory (if he would have written every Congressman a letter stating he knows they’re keeping aliens pent up to pass bills through the House in order to cover up the real reason behind the 9/11 attacks, I don’t think anyone would take him seriously) but he’s basing his expert landing on a real issue: lobbyists are acting as the decision-makers in our government, rather than the voice of the people being represented. Not very democracy-like, if you ask me. Either way, the message you should take away from this story is achieve autonomy — no matter how, and long as you’re not hurting anyone in the process. Sure Hughes riding in on the Capitol building lawn is funny, but I respect him more than most because he took the initiative to fight what he believed was right. And I know (along with a lot of other people) that there are several acts done in this country that questions the premises this country was built on — and that’s stated simply. So fight for your rights as an American citizen: whether you just write a nice but adamant letter to Congress, fly to D.C. on a plane, or in this case both.